One group of inspirational primary school children will be handing out treats in Staveley Market place today (Friday 20th November), in a project designed to show kindness after the atrocities committed in Paris over the weekend. 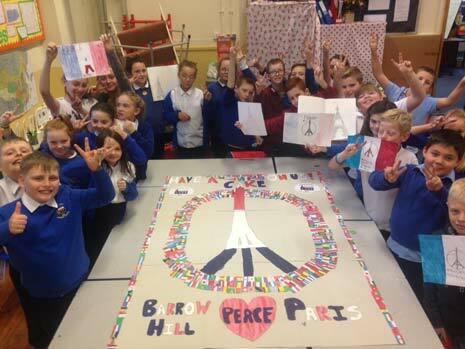 After hearing on the news that 129 people had died, and 99 others were suffering in hospital, some of them on the critical list, after terrorists from the ISIS group opened fire and detonated suicide vests at various sites around the French capital including a rock concert, restaurant and a football stadium, children from Barrow Hill Primary School made it their mission to show that people can help each other. After a discussion in class on Monday, the children decided that after the horror of the weekend they would like to make people feel better - starting in the local community. And word has quickly spread - with two major supermarkets donating buns, Stagecoach buses providing free transport to Staveley for the children, and Staveley Market officers providing a free market stall to display their hand made cakes. Deputy Head teacher, and the children's class teacher, Mr Craig Heeley, told The Chesterfield Post that the project had been led by the children and he couldn't be prouder, "On Monday morning they came into school upset and angry about what they'd seen in the news. With children of this age, it's difficult to approach topics like this. After a bit of thought, we came up with a plan that this would be a positive way forward. "The children have come up with the idea that they will generate random acts of kindness and show the world that there are more kind people in the world than there are bad. "We try and make them aware of things which are going on around the world and sometimes, they do have to see difficult and terrible things on the news and for us, it's about how we can turn such a horrible situation into a positive. "Sainsbury's and Morrisons have agreed to donate buns, and within our own community, children from other classes have made buns, people from the community and we have had a comment from a guy who's from Barrow Hill and now lives in Paris, who was really touched by it. 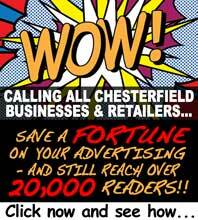 Through social media, we have reached 8,000 people and it's really taken off." Having begun the scheme, the children are excited and thrilled that the idea has captured so much interest. Talking to a group of them in the classroom (below), it's clear that they remain very sad about events in France. Luke began by telling us what they planned to do on Friday morning, "We're catching the bus to Staveley and we've made loads of buns which we are going to give to people in the town centre." Harvey told us why, "We were sad about what happened in France. We just wanted to make people happy and we're going to give free buns to people." Mia was terribly sad about, "The killing of innocent people" whilst Henry added that they had been really pleased with all the help and support they'd had from the community, and their families and friends, "We've baked the buns ourselves - we made some at school and at home. We think people will be happy. Mr Heeley put something out on facebook and it's reached 7,000 people! 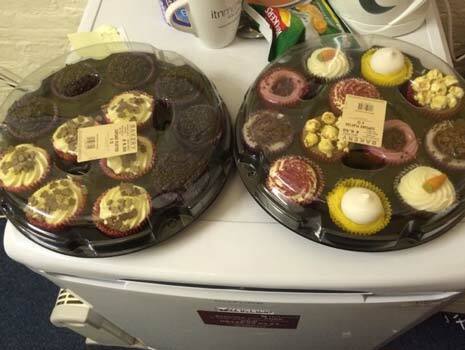 "I rang Sainsbury's and Morrisons and they have donated buns too - Sainsbury's are delivering some today. We are very proud that the community is sharing our project. We have put a lot of effort in. We're going to tell people to stay happy, keep smiling and carry on doing what you're doing!" The children will be in Staveley Market place from 10.15am Friday morning and will be there says Mr Heeley, "Until the buns are gone!" Please pop along for a free bun and a smile!